Click on a section heading to see the FAQ / knowledge base for that topic. Please email Chad WE9V if you have a FAQ that you’d like to see added. Where can I learn about contesting? One great way to learn about contesting is to join a club such as the Society of Midwest Contesters. We have an email reflector where we discuss many contest related topics. Once joining, you’ll have the option to join the reflector, and once you do, don’t be shy and ask away, or just learn from the other discussions going on. Another way to learn about contesting is from Contest University. They have many videos and files from their previous sessions, or sign up for their next CTU! They are sessions even held in Italy, Germany and Australia. Last but not least, a good way to learn about contesting is to operate contests! Learn by doing. Also, tune into other stations and listen to their technique. What software do people use for contest logging? There are a lot of ham radio logging software choices. If you’re already using software for logging your day-to-day QSOs, there’s a good chance that it can also be used for contesting purposes. Read the manual for your software, or contact the author. During a contest, most contesters use contesting-specific software, rather than their day-to-day logging software. This software is written specifically for contesting, not general record keeping and award tracking. One very popular contest logger is N1MM Logger+ which is free. Other popular software includes Writelog and Win-Test. Do I have to submit a log to operate a contest? No, it is not required that you submit a log after the contest, but it is highly encouraged. There are at least three good reasons to do so. First is that your submitted log will be used to cross-check the other submitted logs for accuracy. Secondly, if you are a member of a club, it adds your score to the club’s score for the club competition. Thirdly, some contest sponsors provide you with a report of your accuracy. Sometimes called an LCR (Log Checking Report), it shows you the errors that you made and you can then see where you might need improvements. How do I submit a log after the contest? Most contest sponsors prefer that you email a Cabrillo log to them. After the contest, you would tell your contest logging software to export or generate a Cabrillo file. When doing so, your logging software will ask you some details about your entry, such as your name, address, entry class/category, power used, and club. Be sure to use “Society of Midwest Contesters” spelled out (not “SMC”) as your club. Your contest software will then generate a yourcall.log file. You would then look at the contest rules to find the email address that they would like you to send the file to. Attach the file to your email, and send away. SMC’s very own KX9X was previously the ARRL Contest Branch Manager, and wrote an excellent article Submitting an Electronic Contest Log which is very helpful. Do I need big antennas to contest? The short answer is “NO!!!!”. Get on and operate with whatever antennas you have. Big antennas, like big power, are a luxury that brings its own expense and maintenance. Big antennas can extend your reach to more distant locations as well as make your signal stronger at the receiving end. This means you can work a station quicker and move on to other contacts. The type of contest will be the final deciding factor, for instance a domestic contest like Sweepstakes can be worked just fine with a dipole, but for CQ WW, where zones and countries are important multipliers a dipole will be limiting, but you’ll still have a fun time! Competitive scores are posted in almost every contest from operators running dipoles, which makes choosing a category/class an important decision. What are good antennas for Sweepstakes? Any antenna is better than no antenna. There are people who work Sweepstakes with indoor antennas and post respectable scores. An outdoor antenna will have advantages over an indoor antenna, but it will depend on you specific location requirements. A simple answer would be a dipole. If you can put up a dipole for the bands you want to work, as high up as is practical, and as much in the clear as possible, you will have good success. Any reasonable dipole with 100 watts can work all of North America. A no-so-secret weapon of many Midwest Sweepstakes contesters is a low dipole on 40 and 80M. While some of these stations have big beams on 40M (and even 80M! ), they still find that a 20-40′ high dipole on 40M, and a 30-60′ high diople on 80M works better than the beams many of the times. What are good antennas for DX Contests? As the distance between stations increases, the amount of signal required increases. Any antenna that increases your signal strength at the other end will be a plus, so beams are often the choice here. A good dipole in combination with a vertical (ground mounted or raised) can provide excellent worldwide contacts, but you will have to monitor propagation and take advantage of openings to reach those needed multipliers. I don't have a lot of room. What antenna ideas are there for 80M or 160M? A respected Elmer puts it like this “Get as much wire in the air as you can, and take what you get.” That pretty much says it. If you have space limitations, and large antennas are not going to work, you have to put up as large an antenna as you can, and with the help of a good tuner, you can work quite plenty of stations. As long as you accept these limitations, you can get on the low bands and have fun. A low dipole is okay, and it’s okay to bend the wires to fit your lot. You also find that a really good antenna is an Inverted L, which is a wire vertical antenna, but it’s bent somewhere in the middle. In this case, go up as high as you can (tall tree), and then the rest of the antenna goes horizontal (or sloping downward) from there. You’ll need a ground system too. Without a good ground system, you’ll think you have a great antenna, but in reality you’ll be putting half of your power (3dB) or more into ground losses. The reason why you’ll think it’s a great antenna is because it gives you a great SWR. 1:1 SWR is not an indicator of an antenna’s performance. In the case of a vertical, the radiating part of the vertical is about 32 ohms. If you have high ground losses, say 20 ohms worth, then your antenna looks like a “great” 52 ohm antenna…a perfect match. But in reality, you’re dumping your transmit power into the ground, as the power is shared nearly in half by the 32 ohm antenna and 20 ohm ground. By improving the ground, you lower the ground resistance, maybe closer to 5 ohms or less. Now most of your power goes into the 32 ohm antenna, and very little into the 5 ohm ground. For a vertical ground a ground rod and as many radials as you can get down, the better. If you can only do 2, try it. A better number would be 8. People with the room will put down 60-100, but the point of diminishing returns is somewhere around 60-80. As for the length, again, do what you can. If you have few radials, try to get them a quarter wave long. If you can put down many radials, slightly shorter is okay, such as 80% of a quarter wave (around 100′ on 160M). As mentioned, good vertical with low ground losses (lots of radials) will be around 32 ohms. You can raise the impedance by using a 1.5:1 un-un. Some people will make the antenna a little longer, which makes the resistive component go up, as well as the inductance. Then, you tune out the inductance by using a series capacitor. Or, just use the antenna as-is. Chances are, if you don’t have a lot of radials, you’ll find you have something close to 50 ohms and will make your transmitter or amplifier happy (although you will have some ground losses…a less efficient antenna). How do I get started with RTTY? The best place to learn about RTTY and RTTY contesting is from RTTY expert AA5AU. 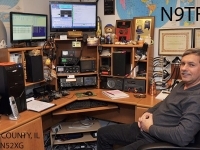 He has a great tutorial Getting Started in RTTY as well as more detailed information at his excellent website rttycontesting.com. Be sure to see the Tutorials page. Do I need special hardware to operate RTTY? Chances are you already have nearly everything you need to make RTTY QSOs. Most people no longer use specialized hardware decoders/modems such as the HAL DXP-38, and are simply using the soundcard in their computer. The soundcard is capable of decoding the received RTTY signals, as well as generating RTTY signals for AFSK RTTY transmission. AFSK is Audio Frequency Shift Keying, meaning that the computer and soundcard generate the audio tones. You would need to purchase or make your own interface cables. Depending upon your radio, they could be as simple as off-the-shelf 1/8″ male stereo to 1/8″ male stereo cables. Some radios use RCA connectors, whereas others will require wiring into their DIN or microphone connectors. You would need a minimum of 3 or 4 wires: RX audio, TX audio, Ground and possibly a separate TX audio ground. In addition to these cables, it’s generally helpful to include audio isolation transformers. These help prevent ground loops and audio hum. These are readily available from many sources, such as Radio Shack part number 273-1380 for $2.99. Further details about the isolation transformer can be found as part of AA5AU’s Getting Started in RTTY. Do I need special software to operate RTTY? Yes, but the good news is that the most popular software for this is *free*. MMTTY is a stand-alone program that can be used for general RTTY operating, but it also integrates into the popular contesting software N1MM and Writelog. There is other RTTY software available such as MixW and Fldigi among others. Also gaining popularity is 2Tone, but it is not a stand-alone program. It must be used with some other logging software and provides another set of high-performance decoders which can be helpful in difficult contesting or marginal signal situations. AA5AU’s Getting Started in RTTY includes a tutorial for installing MMTTY. His Tutorials page at rttycontesting.com goes over how to integrate MMTTY into Writelog and N1MM. What's the difference between FSK and AFSK? FSK stands for Frequency Shift Keying, whereas AFSK is Audio-Frequency Shift Keying. With FSK, you need an interface between your computer and the radio to generate an on-off signal to tell the radio to generate a mark or shift tone. This interface can be purchased, or simply made from a switching transistor (2N2222 or 2N3904) and some other parts. It is the preferred method of generating a RTTY signal, but comes with additional complexities. AFSK is much simpler, but there are things to watch out for. The simple part is that it uses tones generated by your computer’s sound card and you just feed those sounds into your microphone or line input if your radio has one. If you are using your computer to do SSB voice keying, you’re well on your way to being able to to AFSK RTTY. The main thing to watch out for AFSK is to make sure you are not over-driving, otherwise it can create audio (and therefore RF) harmonics. Make sure to keep the soundcard audio low enough that your rig’s AGC is below the top of the AGC scale. Around 3/4ths is fine. Another concern about AFSK is to make sure you don’t have any audio hum on your TX signal. This usually can be cured with an audio isolation transformer. Some newer rigs such as the Elecraft K3 have isolation transformers built in. For both FSK and AFSK, the receive is the same, and is generally our Line Out of your radio to the Line In of the soundcard (unless you are using an external modem such as the HAL DXP-38). What do I program into my RTTY F-key messages? RTTY has a slow transmission rate and can be prone to errors, especially in marginal conditions. Therefore, two important things about RTTY messages/buffers/F-keys are 1) they be short and efficient, and 2) they repeat key information in a way that improves readability and visual confirmation/correlation. The combination of these concepts will help form all of your RTTY messages. This applies to RTTY contesting, and does not necessarily need to be adhered to when casual operating. Rule #1 – Start all messages with a CR/LF except those messages which will be appended to other messages. Rule #2 – Always end your message with one space character. Rule #3 – Don’t use outdated characters or character strings such as DE, K, BK or UR. Rule #4 – Send RST always as 599, not 5NN, and send it only once if required. If not required, do not send RST at all. Rule #5 – Always end your CQ Message with CQ. Always end your Run Confirmation message with either CQ or QRZ. Rule #6 – Send your call (answering a CQ) or exchange information (serial number, etc.) twice, separated by a single space, applying rules 1 through 4. Rule #7 – While applying Rules 1-6, keep your messages as short as possible. Do not use extra spaces. Do not send the other station’s call more than once (unless conditions warrant). Now for some short explanations. If you want further information or in-depth explanations, I’d suggest Google or an email to a RTTY guru. Rule 1 and 2: RTTY decodes “garbage” when a signal isn’t received. By sending a CR/LF at the start, and a space at the end, your actual message won’t get lost in the garbage, or cause RTTY programs to think that the garbage is part of your call/exchange. For example, “AJFHCQ WE9V WE9VABRHF12” or “AFH599 001AFBHF” is much harder to decode into a meaningful message than “AJFH CQ WE9V WE9V ABRHF12” and “AFH 599 001 AFBHB”. There is some school of thought that you can violate rule #1, but you must precede all messages with a single space instead of the CR/LF. Rule 3: These characters are not needed and adds time with no meaningful data. RTTY contest software used to only decode information after ” DE ” as a callsign, but now software is smart enough to use the Super Check Partial database to pull out callsigns, even if surrounded by garbage. For example, it can pull K9PG out of “ADFK9PGMG”, but if K9PGM is also in the SCP, it won’t know which call to highlight. See rule #2, and make sure you use spaces. One exception to rule 3 is if your call doesn’t appear in the SCP file. If not, then preceding your S&P callsign dump, DE could be used. Check the SCP file to see if you’re included. If so, skip the DE. Other than that, never use AR, BK, SK, PSE, COPY, UR, etc. when contesting. Rule 5: Stations will tune into your transmission mid-stream. For example, for a CQ message “CQ TEST WE9V WE9V CQ”, some stations may tune in right in the middle at “V WE9V CQ”. By appending CQ at the end, S&Pers will know that it was the end of a CQ message and now is a good time to call, otherwise, you’d have to wait for another lengthy CQ to start and finish. Also, if you only heard “V WE9V “, it could be WE9V answering someone else’s CQ, so you wouldn’t want to dump in your call if you wanted to work WE9V. Rule 6: It’s essential to repeat important information twice. If you received “599 011 012”, you know that something is wrong with the serial number and can ask for a repeat. But if the serial number was only sent once, “599 011”, how do you know if it’s right? Only when you receive “599 012 012” do you have a fairly high confidence that the correct serial number is 012. The same applies to your callsign. In order to keep messages short, do not repeat things 3 times or more unless the conditions require it, such as a request for a repeat on the exchange or the other station busted your call. In that case, have a separate F-key set up with only the pertinent information. In the case someone asks you for “NR NR?”, don’t send “W4ABC DE K1XYZ 599 001 001″, just send the important stuff, ” 001 001 001 001 “. This message is shorter than the previous message, yet includes the important stuff twice as much more. Also, there is some debate on whether to send a dash between numbers or a space. For now, let’s side on the argument of space. That is, send ” 599 001 001 ” and not ” 599-001-001″. In the case of contests that the exchange is text (as opposed to numeric), definitely don’t do dashes. Send ” BOB WI BOB WI ” not ” BOB-WI-BOB-WI”. The short explanation is that in this case, a single dash takes three times as long to send as a single space. Rule 7: As mentioned, RTTY transmissions are fairly slow. We need to do whatever we can to keep them efficient (short), but not sacrificing accuracy. Repeat important things twice (your call when S&Ping, and your serial number, but not RST), and then repeat it more if asked, but only repeating the important part. Also, don’t include a bunch of spaces between parts of the exchange. It does nothing but waste time and adds nothing to the useful information. So instead of ” 599 011 001 “, just send ” 599 001 001 “. This FAQ, by Bob K2DRH, contains information useful for competitive contesting on VHF/UHF/SHF in the Jan, June, and Sept ARRL and July CQWW contests from the Midwest. It is not intended to be a VHF primer. Much of the information is also applicable to the ARRL August UHF contest. It does not address EME or microwave contests. There are many options depending on the class you enter and how competitive you want to be. Many commercial rigs have VHF and UHF bands and the power limits of 100W on 6M and 2M and 50W on 432 of the SO3B category reflect their capabilities. Most of the commercial multiband rigs are compromise designs to keep down cost and lacking in receiver sensitivity and selectivity, especially on 2M and above. Adding more bands like 222 or 1296 MHz usually means using an IF rig on 10M or 2M and adding transverters. Many have successfully added transverters to an SDR IF rig. There are not a lot of commercial transverters to choose from. A top tier contest hardware radio setup in 2014 when this FAQ was written would be an Elecraft K3 28Mhz IF rig with either their dedicated transverters from 6M to 432 (known as the bottom 4), ones from Down East Microwave Inc. (DEMI), or from Kuhne DB6NT. Add some VHF/UHF brick amplifiers and/or tube/SS amps depending on what class you enter. Like tubes, what kills most transistor amplifiers is over driving them into saturation. Run them at about 80-90% or less of rated output for cleanest signal and longest life. Putting together an effective VHF/UHF contest station can be technically challenging. Depending on what equipment you choose you may have to roll your own T/R relays, preamp relays and transverter switching. DEMI and Max-Gain Systems are a good source of relays. Mast mount preamps for 2M and above are recommended and these and the amplifier stages must be sequenced properly when switching from RX to TX prevent transmitting into them. Sequencers are commercially available from DEMI, SSB Electronics and Kuhne. Switching power supplies and wall warts seem to make a lot of noise on 6M. Wired Ethernet connections can also be a source of noise on 6M and above and not all CAT 5 cables are well shielded. Those labeled 5E seem better but still may require additional clamp on or wound torrid chokes. Wireless connections eliminate this but could become problematic on 2304 MHz and above. How do I get on the SHF and Microwave bands? There were very few ready-made all mode rigs for 902 and above ever marketed. Most of them are older and have fairly high RX system noise figures by today’s standards (more on that later). So to add these bands it will probably be necessary to add a second 144Mhz IF rig, transverters, amps, preamps and sequencers. There is a lot of information on the web about how to do this so it will not be discussed here. Some good starting points are this paper, this article or this website. You should have a method to listen to both rigs at the same time so you can coordinate SHF and microwave QSOs in real time on one of the bottom 4 bands. Signals can be very weak and the QSB very slow and deep, so it’s often helpful (and quicker) to beacon to another station on CW (send dahs) until he “finds” you on the microwave bands and reports back if he can hear you or not. Even if he doesn’t find you, have him beacon back because you may have hit bottom on QSB during his transmissions or you may have the better receive system. Once the correct frequency is established often the other guy can dig you out of the noise. This isn’t called “weak signal” for nothing! Why is the “other guy” off frequency after we QSY? While some transverters come with GPS and other frequency lock options now, many existing ones don’t have them. Consequently the dial readings on the IF rig may be several kHz off due to multiplied LO errors. Even a very small error of 1PPM will leave you a kHz off on 1296. This is normal and you can’t always compensate for it with the transverter’s LO adjustment. The higher in frequency you go the worse it can get and I’ve seen mine as much as 200kHz off on the microwave bands. If you don’t have GPS locked stuff, then run some checks with an established VHFer who has a good feel for where 1296.100 MHz (or whatever) really is and note what your VFO says for future reference. Then tune around anyway because the other guy may be a few to dozens of kHz off despite his best efforts or may be drifting. And unless its frequency standard is GPS locked and verified, to assume that your brand new high dollar all-in-one rig will be perfect on 432 is pure wishful thinking. I often scratch my head and wonder after a QSY with someone to 432, when I call several times before I finally hear a loud signal a half kHz or so off that turns out to be the station I’m looking for. That guy is fooling himself if he’s relying on his VFO to be so accurate he doesn’t need to tune around a bit. Of course, a panadapter or SDR display can really help too. What kind of coax should I use? That’s simple. The lowest loss solid dielectric coax you can get or afford. While on 6M you can afford to have somewhat higher coax loss without significant signal degradation, as you go up in frequency the coax loss can really degrade your ability to hear. Fortunately you can overcome this with a mast mounted preamp on receive but the loss will always be there on transmit. Air dielectric coax tends to fill with water over time when sealed on both ends due to aspiration of humid outside air through the jacket or through the center conductor pin interface to antennas, preamps etc. This occurs during the warmer day, and the water in the air condenses inside the coax when the air cools during the night. It makes no difference how well you seal the ends, it’s probably still going to turn into “9913 water hose”. It actually works much better and stays dry when one end is inside the shack and not sealed since it can “breathe” by equalizing the air pressure. FSJ4-50B Superflex must be handled carefully or water will collect between the shield and the outer jacket by the same mechanism due to imperfections in the jacket that may or may not be visible, and then run down and collect in a sealed up connector. The most effective stations use low loss hardline or heliax for long runs and LMR-400/600 or FSJ4 for jumpers. LMR-400 type antenna phasing harnesses are common even up to 1296. PL259s are not recommended above 6M and N connectors have been the standard for many years since they are designed for higher frequencies. However, the pins on an N connector can be fragile and they sometimes retract, then arc over. Newer captivated pin connectors tend to be better than the older solder or screw-in types since they don’t retract and have better internal sealing to prevent water from migrating into the hardline’s inner foam dielectric itself, should any get into the connection. But if you are starting from scratch, invest in the newer 7/16 DIN connectors for your heliax, they are much better and more forgiving. Low loss rotor loops can be a problem. While conventional wisdom says that LMR-400 or 600 is too stiff, it can be used effectively if the bend radius is not too tight. The ultraflex version of LMR-600 has a tendency to soften in the heat causing the center conductor to migrate and distort, eventually shorting out to the braid. Superflex hardline (FSJ4) can be used, but unless it’s wound in an expanding/contracting helix or bending is limited by a swing arm it will eventually work harden, fracture and become intermittent. To really hear well on most bands you’ll need a mast mounted preamp, except probably not on 6M. First a little basic VHF receive science. Believe it or not, this is the short version. Every object has something called a noise temperature due to internal excitation of free electrons. This is what limits a radio’s noise floor. The atmosphere and background have noise temps as well as the antennas themselves, but the effective atmospheric noise temps go down considerably as you go up in frequency. Mathematically you attain maximum signal transfer from the “air” to your receiver when the noise temp of your antenna system (which includes external and atmospheric noise) and the noise temp of your receiver system are equal. If the receive system has a lower noise temp than the antenna system, then the weakest signal you can hear is still limited by the antenna system noise temp, but you may see some improvement in signal to noise ratio. The most common way to describe noise temp for a receiving system is to use a parameter called noise figure (NF) which is expressed in decibels (db). This is very convenient because coax loss can also be expressed in db and directly added to the receiver NF to determine total RX system noise figure. It’s a lot of complicated math. You don’t need to know it, just understand some basic relationships. What it boils down to is that VHF systems can be optimized for best receive performance using NF, the lower the better. A rule of thumb is that you get roughly 3db better signal to noise every time you cut your total RX system noise figure in half. Every active device like a transistor has a measurable NF. What you want is the lowest NF possible for your cumulative active amplification stages. The good news is that the first amplifier in any amplifier chain accounts for roughly 90% of the entire RX system NF. So by selecting a very low noise device like a GasFET for the first active device you can get total system noise figures of only tenths of a db. The bad news is that coax loss in db adds directly to RX system NF when it comes between the antenna system and the receiver’s “front end”; the first active amplification stage. So even if you have a transverter with a 0.5db NF, adding 3db of coax loss between it and the antenna raises your total receive system NF back up to 3.5db. However by adding a low NF preamp at the antenna it essentially brings the receiver’s front end right up to the antenna. Shack mounted preamps do nothing to overcome coax loss and most of them have NF specs already equivalent to modern day transverters. But if you put a preamp with a 0.5 db NF up right at the antenna it becomes the first active device in the receive system. Then almost all of the coax loss goes away on receive since the first active device of any RX system determines 90% of the total system noise figure. The actual math is complicated but if you add a 0.5dbNF mast mount preamp to our previous example of a 0.5db receiver NF with 3db of coax loss on 432, then total RX system NF actually comes out to be around 0.85db or so. Adding the mast mount preamp cut the total system NF in half twice. This means that in our example on 432, a signal that is right at the noise without a mast mount preamp, will be about 6db out of the noise with one! However since you are more limited by the atmospheric antenna system noise temperature on 2M you wouldn’t see quite that much improvement and little, if any, on 6M. On 6M the atmospheric equivalent noise figure (at zero degree elevation) averages about 10-15db at the antenna depending on the time of year (lowest when it’s coldest out). Notice I said zero degree elevation. As you elevate the antennas up into the sky the noise temperature goes down (much to the delight of EME’ers). Once again the max amount of signal is transferred when the ant noise equals the RX system noise. So unless you have higher than a 10-15db receive system NF, then a preamp won’t do very much for you. A 10db total system RX NF is about equivalent to a K3 on 6M plus about 8db of coax loss. But as we go up in frequency the atmospheric noise and the antenna system’s noise temperature falls quickly off. The average 2M equivalent atmospheric noise figure drops down to around 3-8db so a mast mount preamp is much more useful, but not all the time depending on the ambient antenna system noise temperature and the total receive system NF including the coax loss. On 222 and above the antenna system noise temp numbers continue to drop at a similar rate, so a mast mount preamp becomes essential all the time, especially since coax loss goes up with frequency. The trade-off is that extra preamp gain is NOT your friend after it directly overcomes the coax losses. All it does is amplify whatever the input is, both the signal and the noise, and does nothing more to improve the signal to noise ratio. Too much gain will overload your front end and cause compression, third order intercept degradation, even instability and oscillation. Unfortunately low NF devices have to have gain to achieve low NF’s so you are stuck with dealing with it. Having a preamp in a brick amplifier is useless (unless you have a REALLY bad receiver NF like some older rigs – the popular Yaesu 736R and most older ICOMs come to mind) since it does nothing to overcome coax loss and will likely overload your front end, especially on 6M. Excess preamp gain is not usually as much of a problem on 2M and above as it is on 6M since those bands are not as crowded nor do they usually have such strong signals (during an Es opening I have seen 60 over). What antennas are most effective? Basically, having high antennas is the best for tropo out to 300 to 350 miles, which accounts for the vast majority of contacts for the VHF contests in Jan and Sept and a big chunk in June and July too. For forward scatter contacts, referred to as “tropo”, the lower the angle of radiation the better. The physics of yagi antenna radiation patterns over ground don’t change with higher frequency. Putting them higher lowers the angle of radiation. Reaching beyond 300 or so miles requires some timing, a little luck and maybe some enhancement, but even with “normal to good” conditions tropo Qs are definitely possible over 500 miles when you have enough antenna height and gain. The chances are better when the other station is also well equipped. Of course with ducting events you can really reach out past 1000 miles, but they are rare. Path loss calculations say that on 2M, every time you double your height from a base of 20′ you gain about 2db of Signal to Noise on a long distance forward scatter path, but there is a point of diminishing returns. This quickly pans out to be about 160 feet for most practical purposes. After that point the additional loss from the coax tends to negate any more height gain. Even at this height the loss can be prohibitive unless you compensate for it by using a mast mount preamp on RX, but obviously that doesn’t help on TX so it’s always a balancing act. 80 – 100 feet is quite an effective height and more attainable for most. For ionoscatter on 6M and sometimes 2M, you need all the height and gain that you can get. Luckily, the same high long-boom antennas needed for long range tropo work really well too. In any case, you have to get the antennas above the trees. While 6m is forgiving, attenuation of the signal by trees gets really bad on VHF and above. Anything pointing into trees just won’t be as effective, and 432 and above antennas below the treetops may hardly get out at all. Rovers usually do their best if there is a clear horizon. Now for the old controversy, long boom vs. shorter boom for contesting. The classic argument is gain vs. pattern. While long booms have more gain and hear better and further, the pattern is tight and you cover less area and so may miss someone. This tends to be debated mostly for 2M since that’s where most band runs start (major exception being the Aug UHF contest, otherwise very few stations call CQ on 222 on 432 unless they are a multi), but some runs will start on 6M. 6M antennas usually aren’t long enough in wavelengths to worry much about tight patterns unless you get into the 50′ boom monsters. I find that both points of view have merit depending on antenna height. I have very long boom antennas on 2M, yet can still hear stations out to 300 miles off the sides and back because they are up really high (140′ and 154′). Basically the minor lobes seem to hear just about everything in any direction. But it is pretty weak, and I do have to point right at them for most of them to hear me. So you will need a fast and strong rotor that can be repeatedly cycled a lot. With long boom antennas at lower heights of around 40 feet, you won’t hear as much off the sides. With a short boom antenna at 40’, you won’t hear as well off the sides either, but it does have a much wider beam width and with older (non-LFA) designs, the side lobes compared to the main lobe are usually proportionally less suppressed than the ones on a long boom antenna. I suspect that this may be the basis for many arguing that shorter booms are more effective for contesting. However once you get it pointed right you just can’t beat a long boom antenna for really reaching out into the distance. Stacked pairs of antennas are especially useful. Not only is it an easy increase of roughly 3db without sacrificing any azimuth beam width, but it really cuts down on the rapid QSB that often occurs on VHF and UHF by increasing the capture area. Some have tried putting up stacked omni loops on 2M to hear in all directions with varying degrees of success. However high antennas are not always the best for other modes like 6M Sporadic E (Es). While there is little to worry about Es for 2M and above (it happens on 2M maybe once or twice a year and on 222 maybe once or twice every decade), 6M is another matter. In June and July it can account for hundreds of QSOs and many multipliers. The multiple elevation lobes from a high 6M tropo antenna (or pair) are usually pretty effective, but sometimes the arriving angle is in a null. And arriving angles are constantly changing as an Es opening progresses. High antennas will open the band sooner, but the lower ones are really effective for shorter distance hops due to the high angle of radiation. Often the closer hop in a double hop opening from the Midwest to the West coast is a shorter hop at a higher angle. Hence I always have a rotatable 6M antenna at 20 feet (about one wavelength) to fill in the gaps. It doesn’t have to be much; a 5el Cushcraft on a push-up pole with a Radio Shack TV rotor works well. Often it will outdo the higher antennas with more gain on the high angle stuff and it always provides a second direction when the band opens from multiple directions. It’s not unusual for 6M to be open from 3 or 4 directions at once in the June ARRL or CQWW July contest and change around rapidly, so having more 6M antennas to quickly switch in different directions has definitely proven advantageous. The lower antennas also keep you on the air when the thunderstorms have the high ones covered up in rain static. When are the best times to be on? Whenever Sporadic E is in on 6M. When it’s not open, usually the first two hours of the contest will see a lot of stations on. There tends to be higher activity periods in the evenings from around 6PM local to 10PM and on Sunday morning from about 7 to 11AM. But new folks check into the bands all day long and you’ll have to be in the seat to get them even during the Sunday afternoon doldrums when your rate goes down to 10 or 15 an hour, since most likely you won’t hear them again. The rovers are constantly on the move going to different grids, but most take a few hours off to sleep at night. With “normal” conditions activity dies off after 11PM until about 7 the next morning, but the serious stations and the multis are on trying to make meteor (Ms) scatter QSOs at that time (or on EME). Best time for a single op to catch some sleep is probably between 1 and 6 AM. Ionoscatter on 6M with Ms enhancement occurs mostly in the morning. Tropo enhancement can happen any time in any direction but most often occurs early in the morning and after sunset. This is often the best time for the higher frequency bands too. Where should I call CQ? A lot of folks listen but rarely call. 2M is your main tropo band and where you call CQ most of the time unless 6M is open on Es. But it also pays to CQ on 6M some of the time even when it’s not open to catch the 6M only guys or ones that have small 2M (and even 432) setups. When calling CQ keep your antennas moving (I go about in 20-30 deg increments) and you won’t miss many. But almost invariably the next guy you hear will be way off your beam heading. Use a callsign database to quickly locate fixed stations by their 6 digit grid. The two digit grid will get you in the ballpark, but bearing calculators will use the center of the grid which can be more than 90 degrees off for a station in an adjacent grid. With a bearing and distance calculator like WinGrid, inputting the six digit grid is good enough for pointing an antenna within a degree or two. The rovers pretty much all know their location out to the 6 digit grid so just ask! Unless you have a skewed path due to some obstruction, having an accurate rotor display and pointing to the other guy’s 6 digit grid bearing will even line up very narrow beam width long boom microwave yagis that can have 50 elements or more! Oh and don’t think your bearing to the other guy will be exactly 180 degrees different from his bearing to you. Due to the curvature of the earth it just doesn’t work that way. CQ’ers usually hang out from 50.125 to about 50.150 with 50.150 being a common freq a lot of stations use to QSY from other bands. But when the band is open on Es you will hear CQs well over 50.200 and even below 50.100 on CW (100 to 125 is the DX window and only used for working DX outside the US and Canada). On 2M it’s usually between 144.175 to about 144.225. 50.125 and 144.200 are the calling freqs (95% SSB but CW is sometimes used) and a CQ there often produces results when a CQ on adjacent freqs does not since many folks park there to listen. It’s OK to call CQ on the calling freqs sometimes, especially during off peak times (I try to do it maybe 5-10 mins out of any given hour as I turn my antennas around the clock), just don’t monopolize them and move off as soon as you can or need to coordinate a QSY run to other bands. Folks in the Midwest are pretty good about sharing the call frequency during a contest but this is apparently not the case everywhere. What are some Midwest operating strategies? With fewer population centers in the Midwest, we can’t get the sheer number of tropo QSOs the FN/FM grids can and it’s hard to overcome the 6M Es advantage FL and TX have, so the name of the game becomes getting more grid multipliers. A lot has been said about distance scoring for VHF, but it’s already there; if you can work more distant stations you will work more grids! Call CQ and when you work someone, ask them if they have other bands. If they do, immediately QSY and run as many bands as you both have to get as many QSOs and mults as you can. Depending on conditions a QSO may not occur on one or more bands. So always make a plan to come back to some common place where you hear each other better “if you get lost”, then you can decide if it’s worth to trying again or trying another band. Crazy as it sounds it may be stronger on the next higher band! Often propagation and working conditions demand that at some point you switch to CW during a band run since signals generally will be weaker as you go up in frequency and may not be as good on 6M (there are exceptions with temperature inversion ducting and other propagation modes). Don’t rely on hearing them again later to run the bands; unless they’re a multi op odds are you probably won’t! If conditions are not good enough to work the higher bands, then it may be worth making an on the air sked to try again later or the next day when conditions could be better. Avoid QSYing to the calling frequencies 50.125, 144.200, 222.100 and 432.100 or close to them. You will also hear CW on 6M and 2M when conditions are marginal, antennas are not optimum or the distances are long. I often call a station I can barely hear on 2M SSB on CW to see if he will turn his beam my way, or use CW on 6M with a rover who has a small antenna like a whip or dipole. No need to be an ace CW contester cruising along at 35WPM. The “old fashioned” EME’ers (before WSJT) long ago learned that CW speeds around 15WPM are generally much better suited to weak signal work. If 6M is open on Es, find place to call CQ and run them HF style. This can be pure chaos when the band is covered with strong stations pumping your AGC and the rapidly shifting nature of Es will often suddenly pop up CQing stations right on top of you that will swear they’ve been there all day. They probably have! And while as little as 30 miles difference can bring a whole different set of Es propagation, with both your antennas off the side of each other it’s also easy to land on top of another station CQing within a couple hundred miles without hearing them and have propagation shift so that you both are hearing the same area. During a strong opening to TX or FL from the Midwest look above 50.150 unless you can go head to head with the KWs and have a crunch proof front end that can survive being sandwiched between 40 over signals. But don’t get so caught up on 6M you neglect the other bands. The ARRL contest categories are all multi band. If you hear a local rover or casual contester station with other bands in your pileup it often pays to leave the CQ frequency and QSY to work them, especially if they are in a grid you need as a multiplier. Remember the rover won’t be in that grid again when the opening is over and you’ll probably never hear that other guy again. With a little skill and luck you can keep your CQ freq too. Sunday morning is a good time to try ionoscatter on 6M if your ERP is high enough. Each time a rover changes grids it’s a new set of QSOs for you and potentially new mults so it always pays to track and work them on every band they carry. Many publish schedules ahead of time complete with 6 digit grids and CQ frequencies so you know where and when to look for them. (The schedules are put out as emails on various club reflectors including SMC and VHF Contesting on contesting.com. The Northern Lights Radio Society will publish a link to a contest spreadsheet that’s pretty specific to the midwest that pops up a week or two before the contest.) Of course some don’t and plans change, so ask them when they think they will be in the next grid and make a note of it so you know when to look for them again. Another considerations is doing WSJT FSK441 meteor scatter skeds after activity dies off at night with the multis and more serious stations out to 1200 miles or so to increase grid totals. Spend some time on Ping Jockey to learn the procedures and protocols and work some before you try to do it in a contest. In the past, skeds were usually prearranged before the contest began, but you can call or answer CQ’s successfully on 6M on 50.260 and if you are sharp can QSY the other station to 2M from there. The CQWW VHF rules and recent rule proposals by the ARRL for single ops may change that by allowing you to post and view CQ announcements. Prearranged skeds to do both bands (6 and 2) are usually a half hour but may be shortened to 15 mins between two really good stations in June and July when the rox (meteors) fly the best. Ms is relatively easy on 6M with most antenna systems, and doable with the high antennas used for 2M tropo due to multiple elevation lobes, but lower ants with a wider beam width are more ideal for the radiation angles and the cone of potential reflections involved for those in the 600 to 900 mile range. Most don’t even try 222 in a contest since the skeds run too long and the percentage of success is too low. For WSJT FSK441, it’s necessary to be within a couple hundred Hz of the other station to decode so be sure you know where your rig is tuned. Auroral scatter (Au) during a contest is rare but not unheard of. It’s possible to do on SSB on 6M, but 2M and up require CW since the signal is Doppler shifted and spreads out more in width the higher in frequency you go. The problem with aurora is that most of them are not really strong or long lived and hardly ever support bands higher than 2M. When that’s true, the majority of stations you’ll hear will be within 350 miles in a wide sector roughly to the north of you (say Az 290 to 70 degrees); basically in normal tropo range if you have good high antennas. Activity may increase but everyone points within 30 or so degrees of north and nobody wants to turn to QSY to other bands while the Au is in progress. So if you work them on 2M Au, then you have to find them again later on 2M tropo to do a band run. During an aurora event I tend to cherry pick the few stations far enough away that I know I can’t work “normally”, then look south for stations that are probably not in the effective aurora zone but are pointing north to listen. As the Au wanes, the stations to the north usually stay on for a while to check out what else is going on (or see if it comes back) and you can work them like you normally do. Does using a spotting network put me into a different category? Depending on the contest, the use of a spotting network, skimmer, or other assistance can put you in an assisted category. Some contests might put you in an unlimited or multi-operator category. And again, some contest will allow spotting networks even for single-ops without putting them into a different classification (such as WAE, among others). Read the rules for each contest to determine how the use of spotting assistance affects operator category. Where can I access a spotting network? Back in the “old days”, Packet Cluster was exclusively via, yep, you guessed it, packet radio. Generally it was on 222MHz or up or down one band. You needed to be near a cluster operator. That was before the popularity of internet. Now, spotting networks, DX clusters, and the numerous variations are available on the web, some accessible with a browser while others require more specific software, like telnet, to access the content. Use your favorite web search engine and search for “spotting networks” or “dx cluster”. A simple interface is just using your web browser. Some very popular DX spotting websites are DX Summit, DX Watch, and the Reverse Beacon Network (CW Skimmer spots). Also note that there are different DX cluster server software types. There’s AR-Cluster, DX Spider, and CC Cluster. Each have little nuances between them. Several clusters are run by SMC members such as AI9T and W9PA, among others. Dave, W9PA’s cluster is very popular, running AR-Cluster. A popular, somewhat local, CC Cluster is by AE5E in MN. One neat thing about CC Clusters is that you can easily change all of the complex filter settings by using a program CC User, which is also written by the author of the CC Cluster software, VE7CC. What is a CW Skimmer? A skimmer is a specific piece of software coupled to a receiver (usually a Software Defined Radio or SDR) that monitors a portion of one or more amateur bands looking for signals to decode. This software can detect when a station is calling CQ and post the detected station to a spotting network or cluster. Some skimmers can detect RTTY and PSK in addition to CW. The quality of the spotted station depends on many factors, such as signal strength, operator “fist” (CW), and QRM/QRN; this means not all spots accurately reflect the station detected. Often, skimmers are co-located with DX cluster servers and can be leveraged to determine where signals can be heard. How can I get spotted by a Skimmer? The CW (and RTTY) Skimmers key off of a few keywords, such as CQ and TEST. Therefore, make sure your CQ message includes at least one of these, and that they are separated from other words. “CQ NA de WE9V” is better than “CQNA de WE9V”. It is also preferred that you send your call twice to aid in decoding. If you choose not to, that’s fine. It will just take another CQ or two for the Skimmer to make sure it has your call okay before spotting. Also, make sure to call CQ at least once every 10 minutes (for example, only sending “TU WE9V” at the end of each QSO during a large pileup…generally not an issue for most of us Midwesterners). Also, not normally a concern for most of us, but don’t use a funky exotic call such as W2015AW or HF90IARU, because it won’t be in the Master databases and doesn’t conform to normal callsign structure. Lastly, to maximize the number of Skimmers available to hear you, CQ in the bottom ~90 kHz of the band if you can. Different Skimmers have different bandwidth capabilities, and some Skimmer operators may limit the bandwidth or forget to increase the bandwidth during a contest. While some Skimmers are capable of skimming the bottom ~190 kHz, others may only do 40 kHz or 90 kHz. Generally, this is only a concern during major contest weekends when activity extends beyond 14.100, 21.100 or 28.100. If you are concerned about this, try to CQ below 090 on any band. To see if you’re being spotted, test out your CQ before the contest at the Reverse Beacon Network.